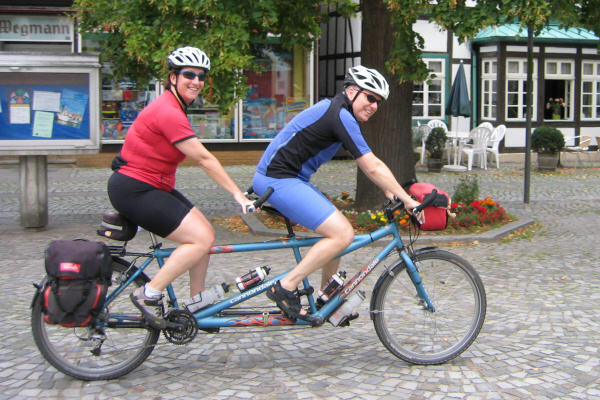 This event was the 19th International Tandem Rally organized on behalf of the Tandem Club. Two hundred and seventy people attended from many countries including: Belgium, Denmark, England, Germany, Ireland, Israel, the Netherlands, Scotland, United States of America and Wales. It was a very enjoyable week at an interesting rally site based around an old windmill - accommodating tents, caravans, motorhomes and even non-campers in "little wooden sheds", with plenty of covered seating areas for gatherings and kitchens for cooking; a small lake in which the children had a wonderful time. There were Children's Clubs on most days between 09:00 and 10:00. Routesheets provided were excellent and very detailed, with interesting destinations for all lengths of rides. 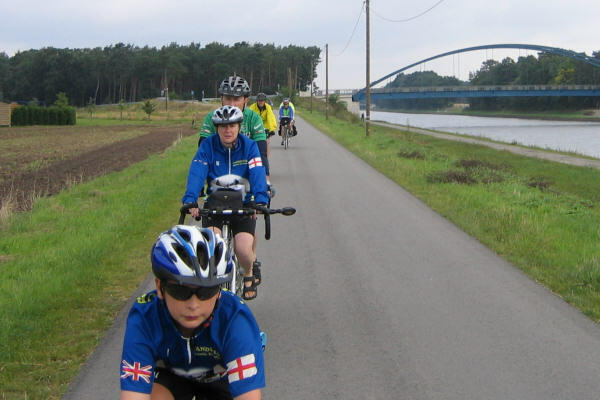 Nice varied countryside with both rolling and flat terrain. Weather generally kind to us with a couple of very hot days and some rain towards the end of the week. Tricia Anderson and Neville Frost rode the medium length rides on all days and the following, brief summary is an extract from Tricia's personal diary for the week. Arrivals day (though many had arrived already on Friday). Photo call for local paper followed by welcome speech by local administrator and excellent beer and pork roll - lots of chat & catching up. Quiz rather difficult to do whilst also keeping up with the very detailed route directions. 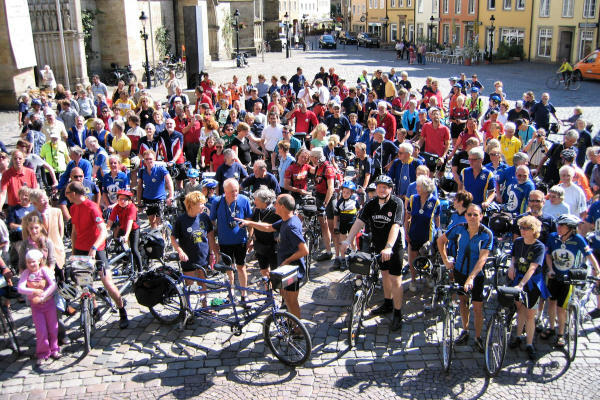 Into Osnabrück Market Square for first coffee and cakes of the rally - excellent! Picnic lunch by pool in forest near Bad Iburg. Tea and ice cream by pitch & putt near Rubbenbruch Lake near Eversburg. To Venne and the Wafer Museum and shop and small café. Picnic lunch in pretty "treed" market place in Bad Essen. Back through Wallenhorst (supermarket). Bring & Buy in evening. Through busy Bramsche. Coffee on dyke by Lake Alfsee. Picnic lunch in Damme. Tea and ice cream at Varusschlacht Museum. Back through Wallenhorst. 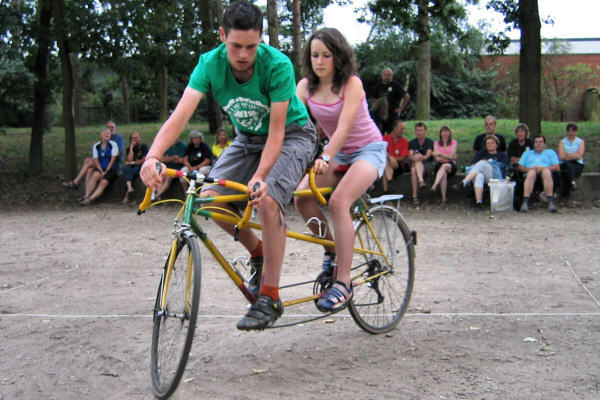 Tandem Games - Tom & Hannah Payton won both the skills test and the slow race. 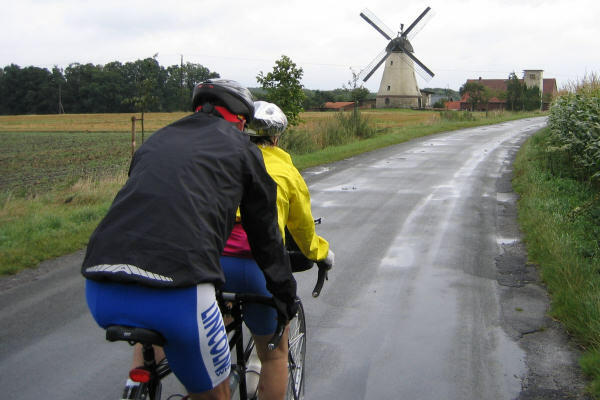 Weather: Rain to sun, bit windy, heavy rain dump near end of ride. Into Osnabrück Market Square for the Mayor's welcoming speech. Very good guided tour of old Osnabrück. Own devices to look around & check out good bike shop, have lunch, ice cream, coffee & cakes, ride to nearby attractions. To Belm and a very good café for coffee and local plum cake. Schelenburg Castle café closed 'til 3pm - rain downpour. Picnic lunch in cemetery. Ride north east of Osnabrück - some went into Osnabrück to visit bike shop again and enjoy coffee & cakes. Weather: Cloud, some heavy dumps of rain. 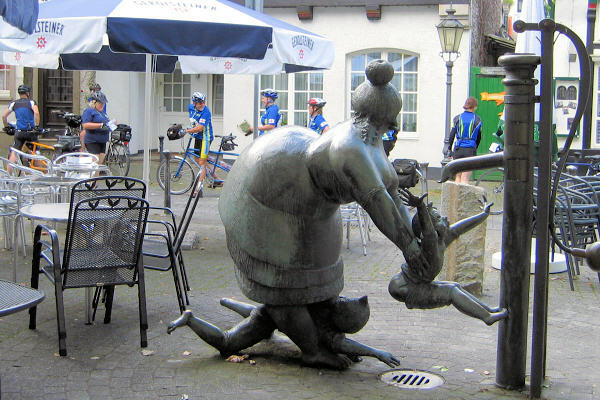 Through Westerkappeln to Mettingen café for coffee & cake. Picnic by Brochterbeck town pond (+ ducks) - heavy rain - cold hot chocolate! Up, up hill to Tecklenburg historic town; cycle/walk up to castle tower at top of hill. Back through Lotte. 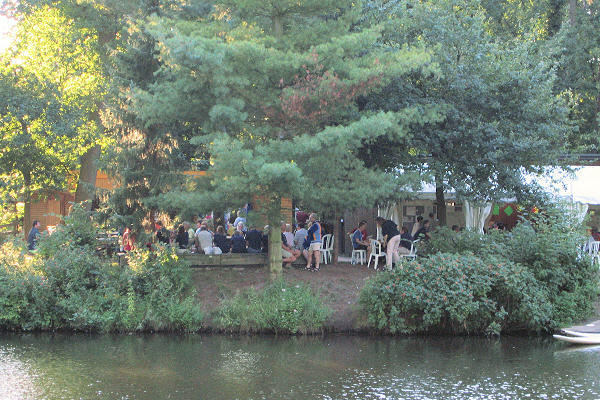 Farewell Barbecue - traditional meat burning - thank you presentations and speeches.